Friends come and go in everyone's life. Along the way you'll meet all sorts of people from every walks of life. Sometimes you befriend them but sometimes it was just a kind of hi-and-bye friends. But a true one is very rare and you can't spot them immediately even when you have all the chemistry in the world. When you do, hold on to them and don't take them for granted. When I first met Ria it was in a course called BTN organized by the government. It was a requirement....well more actually of a compulsory for every government scholars who's going to pursue higher education overseas. I wasn't looking forward for the course as I knew no one at the time and had to spend 4 days doing all sorts of outdoor activities which isn't my forte since I grew up and had my period. Believe me it's nasty when girls had their period and their boyfriends excitedly asked them to go camping. I assure you what comes after is not a very pretty scene. Anyway, All I had in mind was to get BTN over with and get the certificate so I can go and continue my study already. We were located in a huge dorm of 20 and I was probably one of the youngest to be there at that time. Most of the PhDs pursuer are either married of have kids or have been working for a while. I on the other hand was a very fresh grad. I feel so little that the dorm people started to stamped on my forehead saying "a school girl lost somewhere in the woods". I swear some of the aunties (or kakak? hahaha) try to bully me one way or another.I was so innocent!! It feels like boarding school. 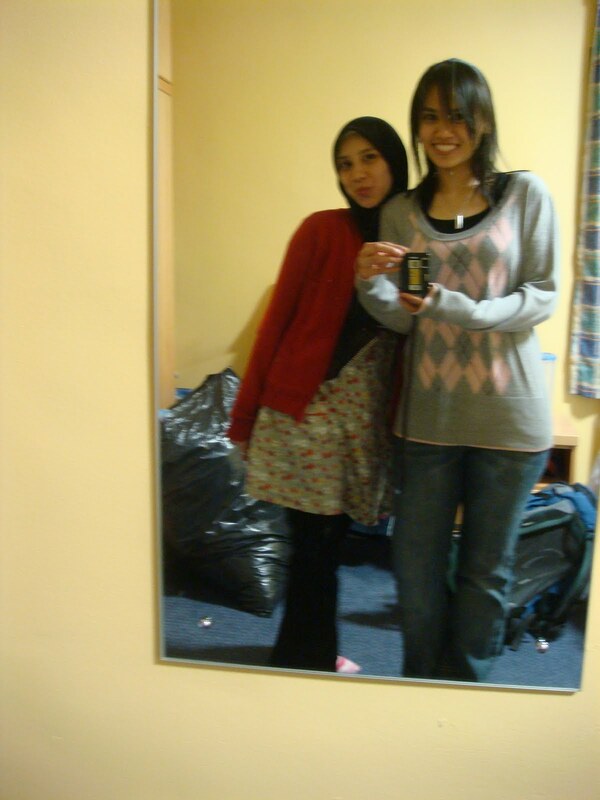 But it was a very fun boarding school with a bunch of funny aunties with a lot of stories to tell. So this girl named Ria was in the same dorm. We didn't click immediately. She claimed she was a quiet girl (right!). But I thought she looks a bit snobbish ( Hi babe!!). It was the final day there that we started to talk to each other and it turn out it was one of the most fun course I've been to because I made a lot of friends with the professionals and brilliant minded people. Just when it was new year 2008 that Ria contacted me for a tour in London and new year celebration. Who does she thinks I am? A london tour guide?! O_o Truthfully we were so excited to see each other we hit it off instantly like we've been friends forever. That's when I realised we had so much in common and there were chemistry.A lot. And this type of chemistry was different. It almost feels like love at first sight except that it's not (if that make any sense). In short we love being in each other company. Once it was an exam week, I had to stay all night studying and Ria would stay up too to finished up her essay or report or something. She took English so she had to read dozen of dozen of journal papers. And she keeps complaining about her nasty supervisor who knows everything and even knows every quotes of who said what and when from english literature books. That supervisor of her gives me the creep. So we had to Skype every night to keep each other company and to keep an eagle eye on each other so that none of us will loose concentration and go to sleep on the computer keyboard. But that girl, very naughty one I tell you. It always ended up with her watching youtube or chatting with her bf or mother or cousin or nieces or her pet instead.After that she would give an excuse that she's hungry and went to the kitchen to cook maggi. Then she'll have a shower afterwards, another excuse to stay awake and then end up sleeping with a defence of saying she'll wake up within 10 minutes (ya right..we all know that would never happen). She would do all sort of things that she suppose to do daylight and.........(I could go on forever). I would then be the mother who give lectures but end up going in one ear and out on another ear. Sigh! I don't know what did I do to deserve this. 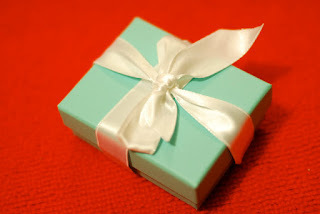 A cute turquoise box. I then open it and found a little note from Ria and Shimi. It was so sweet I immediately call Ria. Me: Oh my god! Babe! Tiffany? Really? Me: Oh yeah!..about that.. I really thought it was a joke! HAHA, I had to find my binocular to find it. Ria: Really? that bad??!! too small? You just can't stay mad when your friend gives you Tiffany& co. If this is what it takes I'm definitely going sulking again. Haha. The note was saying that it's a really really late anniversary gift. whatever. I don't really care. I'm just happy and grateful to have such a friend. Not because she gave me gifts of course. But because she understands me and didn't take me for granted. Even though I didn't contact her or forgot about her when we separated a few months back, she didn't even once complaint and didn't say I forget her. Instead she'll call and said she misses me. She never get offended even when I voluntarily become her unofficial mom and told her off that she's lazy and stop eating maggi a lot in the middle of the night because it's making you fat and don't sleep and do your job. 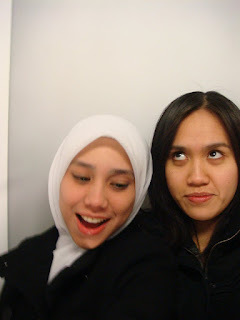 Well....that was the old days when we did our master degree. I know she's a very hardworking researcher now and didn't eat maggi anymore in the middle of the night (or did she? ).